Yes, because they’re TVXQ, they are our TVXQ, whether it be 2 or 3, we’ll accept them all the same. As long as you’re good and well, as long as you’re able to stand on that stage, even if there’s only one of you, we’ll love you all the same, because it is Jung Yunho, Shim Changmin, Kim Jaejoong, Park Yoochun and Kim Junsu that we love, but above all, it’s TVXQ. 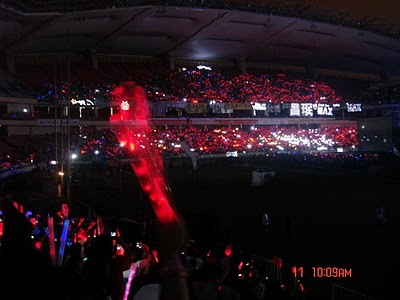 We look forward to seeing another red ocean on October 23rd, one for the other three at the exact same place, Hongkou~~. We’ll scream Dong Bang Shin Ki with everything we’ve got and we’ll wait. Because we were separated to be reunited and we will continue to believe. My daughter pretty much never switches off her computer, she spends all day every day on Korean sites or here on Baidu, surfing the web. I’m sure there are a lot of people here who like TVXQ as much as my daughter does, if not more. Ah.. My daughter, sometimes she sits in her room crying, other times laughing. Whenever we’re sat around the table at dinner, she’ll jabber on and on about TVXQ, about Yunho to me and her dad. It’s almost as though she’s gone insane. Every now and then, she’ll talk to me about going to Korea for days and days. I remember her telling me you fans were organizing some kind of group dance this summer? (flashmob) When she was young, we used to send her everywhere and pick her up afterwards. She rarely goes on public transport because our home is simply too far away from the city. I still remember her excitement when I agreed to let her go to practice sessions for the flashmob. Her father said ‘Will you be dancing to songs of TVXQ? Don’t muck up and embarrass yourself~’ I nearly laughed. That morning, she went off with her friends to catch the bus and still hadn’t come home after 6. I panicked. She wasn’t picking up her phone, and it wasn’t until 7 that she was finally home. Her father said in relief ‘I thought you wouldn’t be able to make it, but you managed to get back yourself’ And from then on, she went to dance practices every week, and sometimes she’d even practice in front of us. I’ve never seen her take anything so seriously before. I remember once last year, when we were having dinner, she was arguing over something with her dad… I think it was about TVXQ. She said she wasn’t going to eat and was absolutely fuming. I kept asking, but she paid no attention to me. In the end, I found out that she’d wanted to see TVXQ in Shanghai. In being a fan, I hope you treat your idol as your motivation and target so that you’re able to achieve the things you want in life. As fans, I hope you’re able to make your idols proud. TVXQ are great kids, I thought it was just an infatuation at first, but now I sincerely believe in faith and determination. Please continue to protect your idols! Don’t forget: In protecting those you love, you must also work towards making yourself a better person and make your idols proud. There are lots of you out there who are high school students, university students or even working adults. Please be the best you can be and keep your faith for TVXQ. Loving someone is no simple feat, you’ll understand when you grow older. But watching you guys and seeing your love for them has made me realized how much you’ve grown as a result of this fandom. You’ve all really matured. Finally, I’d like to thank TVXQ and to thank you Cassies (is that what you’re called?) You’ve really helped my daughter along the way. She’s changed so much. She now knows the meaning of determination, of faith and belief. Everybody hwaiting! 1. Female, usually born in the 80s (after ’86), single. 2. Little to no previous dating experience prior to ‘meeting’ the 5 members of TVXQ. After meeting TVXQ, dates = 0. 3. You compare everyone you meet with the boys and nobody seems to meet your standards besides the 5 of them. 4. You refuse to imagine what life would be like for them after they’re married and you feel an immediate dislike towards any female that appears beside them. * Kim Junsu – Omo! Look at that adorable smile! * Jung Yunho – Oh he’s so manly! 4. You read anything and everything you see related to the boys, you completely lose control whenever you see photos of your bias and you incessantly collect them because you just can’t get enough. Without realizing it, you begin to compare all creatures with XY chromosomes (males) to your bias. 5. You’re greatly inspired by the boys’ determination and dedication and you try as hard as you can to do the same. You want to do well in school and to get one degree after another. 6. When you finally reach the age to start dating, you realize that most people are too afraid to ask you out because they know that you have outrageously high standards. My teacher is a 45 years old, beautiful temperament lady, who is responsible in teaching us chinese language. She is a humorous and nice lady. She became Cassiopeia 1 year ago and is currently intoxicated by TVXQ. First, let me introduce the glorious history of my teacher. She set the 7th period class of every Tuesday and Thursday as “TVXQ’s DVD appreciation lesson”. Every time, she will pull down a large screen, and plays various DVDs of TVXQ which she brought from home. There were concerts, “History in Japan” series and so on. Sometimes she will sing and dance along while watching DVD of their concerts. However, her ability in dancing and singing is a bit…… so my class usually burst into laughter because it was too funny. Once because we laughed so hard, we were scolded by school director…. Got once she finished her teaching earlier, and we got nothing to do. We were silent for a while, then she suddenly said, “Since we still got a lot of time, how ’bout we talk about TVXQ?” And all of us agreed. Then we started our “General knowledge of TVXQ” lesson. My teacher is indeed a super fans, from TVXQ’s each member’s name, height, blood group, experiences, she can remember all of them clearly. She knows almost everything I knew. She told us that she originally thought only TVXQ’s fans would listen to her when she brought up this topic. She did not expect everyone would listen to her seriously, and she was very happy. Therefore, starting from that day, we have our own “General knowledge of TVXQ” every time we finished our lesson earlier…………….. There is a beautiful landscape at the back of our classroom, which is —— giant posters and calendars of TVXQ. Well, of course, that’s my teacher’s masterpiece. She said that she is more energetic in teaching us when looking at TVXQ. These are the glorious history of my class teacher. To be honest, I have never heard of such lovely teacher. Now we are practicing ‘Why Did I Fall In Love With You?’ and purple line. The dance steps of purple line are really difficult. Lastly, I want to shout the phrase that I always shout with my classmates and teacher: TVXQ FIGHTING! JYJ a-nation Fighting! Ho-Min SMTOWN LIVE Fighthing! I am going to attend both of them! Today is a day that no Cassiopeia would ever forget. It’s been a year, and it’s gone by in a blink of an eye, hasn’t it? We’ve waited an entire year, and in truth, it is undeniable that this period has really shown to us all how much we genuinely love our boys. Throughout this time, we’ve had our doubts, our worries and even conflicts amongst ourselves, but all that is behind us now, we’ve made the decision to stay, and to keep waiting. Cassiopeia is a force to be reckoned with, seeing our enthusiasm, it’s almost as though nothing ever happened. Every now and then, we may speak of our boys, about how much we miss them, but it’s only because we want to see the five of them together again. We motivate one another, we encourage those around us to stay positive, and we vow to wait together; I’m proud of what we’ve achieved, of this entire fandom. Some say they are charmed by our boys’ looks, some by our boys’ music, and some by our boys’ love and emotion. Me? I’m a fan of these fans. Others may not ever be able to comprehend this kind of unconditional love that we fans have to offer, yet we sacrifice it anyway, to a point where we could almost be deemed reckless and foolish. Even if we may never see those that we love, we love them anyway, regardless of other people’s words, perception and lack of understanding. Some say that to be a fan of an idol group is to inflict pain upon oneself. Groups inevitably separate, leaving fans with no choice but to focus their support on one particular member. On the other hand, we are Cassiopeia, and each and every one of us knows that we will continue to support DBSK as a whole regardless of the outcome of this difficult situation, wouldn’t you agree? because you are held tight. I thought of such lyrics as I sang, and I wrote it down. I tried to describe a sweet and gentle romance. Even in the future, for the 5 members’ activities, together with everyone, I will be supporting them with my heart. So that everyone will be very happy from now on. The “Plea for Reconciliation Signature Campaign” among Cassiopeia, DBSK’s Micky Yoochun, Xiah Junsu, Youngwoong JaeJoong and SM Entertainment (otherwise known as SM) has officially begun. There are the Korean, Japanese, Chinese and English versions on the website of the signature campaign. This campaign is not just limited to local fans in Korea, but international DBSK fans are also allowed to participate! This campaign was started based on the unconditional trust placed upon the numerous fans of DBSK, along with a minority of fans who may have a different thinking and opinion. The purpose of initiating this campaign is not to ask for a termination of the contract of the three members, but to get them and SM to coordinate for a more sensible solution. In addition, based on the first public trial between the three members and SM company held on the 7th, if both sides still remains unchanged in their stand, the differences between them will still not be resolved. 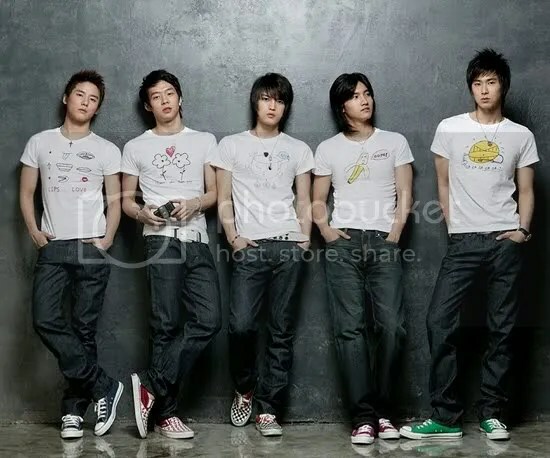 DBSK’s three members had submitted an application of deposition to the Seoul Central District Court on 31st July 2009 regarding the termination of the exclusive contract with SM. T/N: The website for the online campaign was not included in this article.